haha I am first......can't wait for his BIG match!!!!! Mayweather has huge boxing advantage. As you know comments section of YT is just a cesspool so I went there just to see what's going on......was not disappointed.....they believe McGregor will win. Those people are insane! They are convinced, religiously convinced about McGregor winning easily. I can understand where they're coming from though: they feel as if MMA has lived in the shadow of Boxing, and this fight somehow holds the weight of sports supremacy. I just wish peace and love for everyone and a good time for all fans of combat sports. The guaranteed money for this fight is $100 million for Mayweather and $30 million for McGregor which means whoever wins, they will get this money. Who do you think will win? I think Mayweather is at an advantage here because boxing is his home turf plus he has been undefeated so far. Remember his last match with Manny Pachquio which was equally hyped!? Anyway the weights are in and Mayweather stands 149.5 pounds while McGregor at 153 pounds. 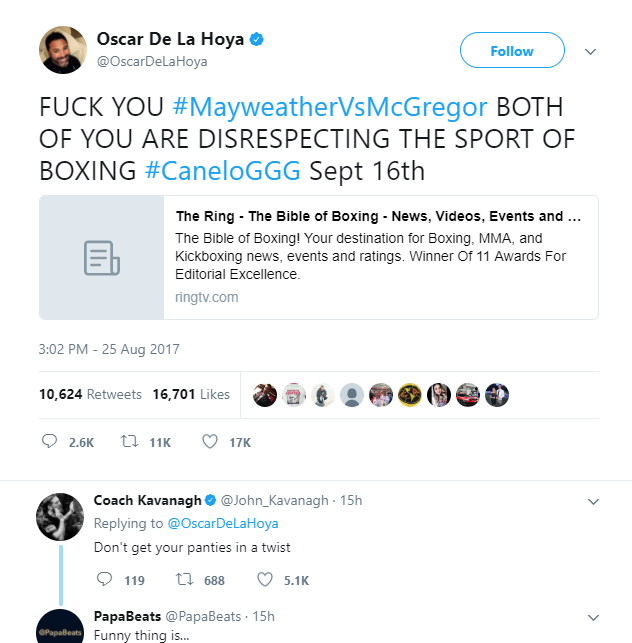 Did anybody see confusing tweet from Oscar Hoya? welp...i believe MG will either be horribly outclassed, or he won't be. So it puzzles me why boxing fans, the kind who think McGregor is going to get killed, aren't embracing the chance to find out. They've been telling everyone for years and years that boxing is a serious sport, it takes years to learn, and you can't cross over from other combat sports. Finally, with the world watching, here's the best imaginable chance to prove it. A chance to be proven right like comes around not even once a generation. It will be a moment of glory, of epic I-Told-You-So's! Look forward to it! Quote: It was always a question of when. Every man has his price and Floyd Mayweather knew that Conor McGregor, the most popular active combat sports athlete in the world, was the only one capable of meeting his demand. What started as a rumor graduated to banter. Banter graduated to legitimate business discussions. 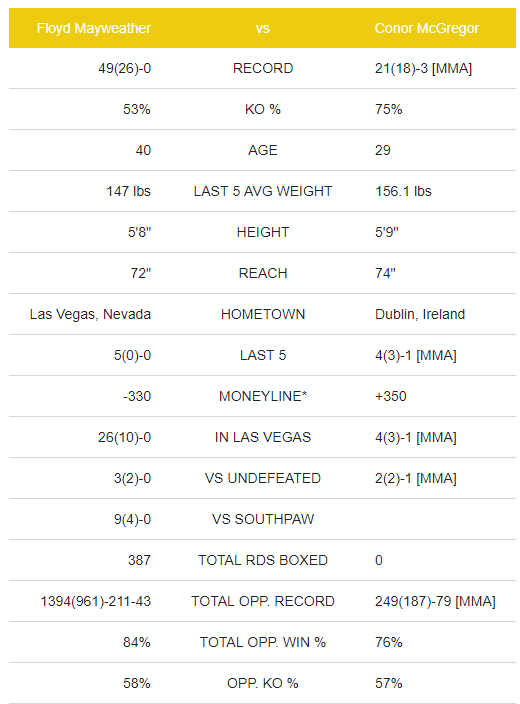 And before we knew it we had Conor McGregor spurning whatever options he had in the UFC to enter the world of boxing. (08-26-2017, 07:44 PM) TheGuru Wrote: Did anybody see confusing tweet from Oscar Hoya? Mayweather shot down Khan "get real and stick with TV"